One of the biggest ongoing questions surrounding BioWare’s upcoming online shooter Anthem is whether it will be able to hit the narrative bar that the studio has set for itself through series like Dragon Age and Mass Effect. With a new trailer tonight—and a presentation to press this morning in Los Angeles—BioWare is trying to assure fans that even its take on Destiny is doubling down on story. Anthem’s new trailer, which debuted at The Game Awards, shows some of the non-playable characters as well as the game’s main antagonist, who’s known as the Monitor. 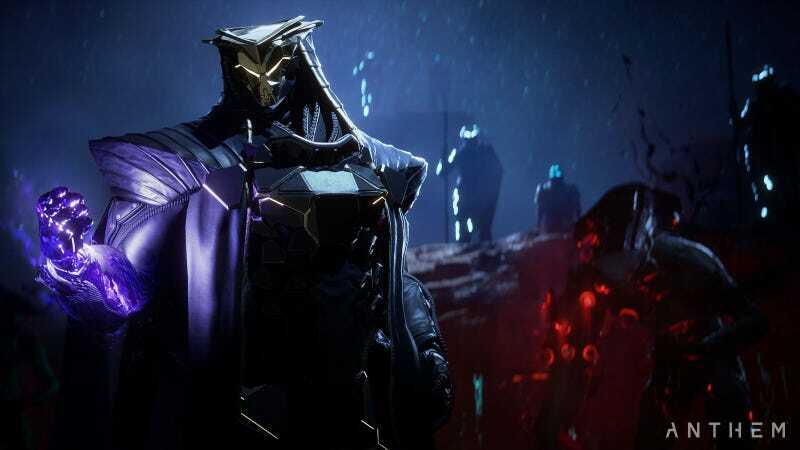 BioWare says he’s the leader of a militaristic organization called the Dominion that will be one of the player’s biggest enemies throughout Anthem’s main story. Your group, the Freelancers, is an order of storied mercenaries who go around the world fighting aliens and preventing bad things from happening as a result of the Anthem of Creation, an energy that exists throughout the game’s world, sometimes bubbling up and causing catastrophes. The Dominion is at odds with the Freelancers. So how, exactly, will Anthem’s story unfold? There won’t be a lot of non-combat options in Anthem, which is structured around a single hub (called Fort Tarsis) in which you do all of your interaction with NPCs. You will get some dialogue options that will affect how these NPCs treat you, although the game’s developers say there won’t be any sort of branching narrative the way there is in Dragon Age and Mass Effect. When you’re not talking to people in Fort Tarsis, you’ll be off on missions and activities within the game’s world, flying around your mech suit (called a Javelin) and blasting aliens, which from what we played at E3 last year seems pretty damn fun. As anyone who’s played a game like Destiny knows, it’s hard to marry a coherent story with that sort of online gameplay that’s meant to be repeated over and over again. BioWare is aware of that, and appears to be happy to partition the main story from the grindier activities that will keep Anthem humming. Those world conflicts will form the backbone for Anthem’s side missions and replayable activities, and they’ll be enhanced by what lead gameplay producer Mike Gamble teases will be “plans for how we switch and morph the context of the game after launch.” They’re promising a more aggressive update schedule than DLC that arrives every few months, which will hopefully offer narrative innovations that we haven’t seen in a game like this before. “We’re going to give a big briefing on our post-launch stuff later on,” Gamble said. There’s no way to know whether this new game’s story will actually live up to what we’d expect from a BioWare game, and we won’t have an answer to that question until we’ve played all of Anthem, which comes out February 22, 2019 (PS4/Xbox One/PC). But the studio wants fans to know that it’s still prioritizing narrative, and one thing’s for sure: The story’s gotta be better than the first Destiny’s was. Right?